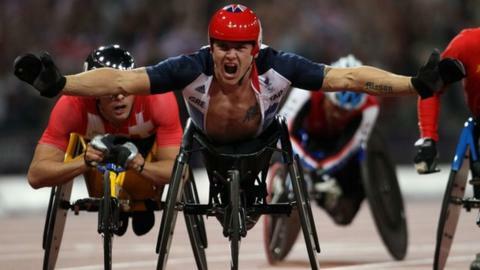 Four-time London 2012 Paralympic gold medallist David Weir wants to break Baroness Tanni Grey-Thompson's London Marathon record in 2013. Weir won this year's race to move level on six wins with Grey-Thompson. And he told the 11-times Paralympic gold medal winner on BBC Radio 5 live he wants the record to himself. "I want to win London for the seventh time but it will be a tough ask because I won't be back in my racing chair until after Christmas," he said. "I don't like being equal," he joked with Grey-Thompson, during an interview for "Tanni and Marc's Paralympic Feast" which she co-hosts with fellow BBC pundit and former Paralympian Marc Woods on 5 live on Sunday, 30 December. Weir went on: "Before London I thought I would retire after the Games but I enjoyed the last phase of training so much and what I did in London was special and there are still a few challenges for me. "I also want to compete in the Commonwealth Games in Glasgow in 2014, because I've never had the chance to represent England, and I would also love to compete in the Boston Marathon and try to win another New York Marathon." Weir is one of a host of British Paralympic stars who are reliving the Games in the programme along with the likes of cyclists Sarah Storey and Jody Cundy, swimmers Ellie Simmonds and Josef Craig and equestrian star Sophie Christiansen. Grey-Thompson also believes that the International Paralympic Committee need to look at the issue of blades after the controversy surrounding Oscar Pistorius and Alan Oliveira at the Games. Pistorius suffered a shock defeat to the Brazilian in the T44 200m final and afterwards claimed that he wasn't in a fair race because of the length of Oliveira's racing blades, although the South African later apologised for the timing of his remarks. "Because of Oscar's desire to run at the Olympics, it made it much harder for him to run in the Paralympics," she explained. "He basically had to limit the height of his blades so he could compete at the Olympics and what Oliveira did was run at the maximum height he could. "It has been said that Oscar could have been running eight inches taller in the Paralympics but between the Olympics and Paralympics he couldn't change blade length because it would have meant completely changing his stride length and pattern and how he reacts to leg movements. "Athletes are saying more work needs to be done and as technology advances it changes how they run but the IPC need to look at the rules for the credibility of the particular event." Meanwhile, British Paralympic Association chief executive Tim Hollingsworth says that although 2012 has been a defining year for the Paralympic movement in the UK, much more needs to be achieved to ensure lasting impact. "We cannot be complacent and there is still much to be done to maintain the momentum coming out of the Games," he said. "We have already turned our attention to Sochi and Rio and are working hard to ensure that we do everything possible to enable the athletes to deliver their personal best performances that will lead to medals and just as importantly, help inspire disabled people to get active and non-disabled people to re-frame their attitudes towards disabled people. "Whilst a home Games have brought a really positive image of disabled people to the fore, we recognise that there is still much to be done if we are to achieve our vision of 'through sport, inspire a better world for disabled people'." Tanni and Marc's Paralympic Feast will be on BBC Radio 5 live on Sunday, 30 December at 11:00 GMT and repeated at 05:00 on Monday, 31 December. How long can runners' blades be? Read more on Pistorius Paralympics gripe: How long can blades be?